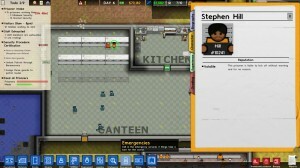 Prison Architect has earned several accolades even before the game was officially released; it was one of the first crowd-funded games off of Kickstarter and the current poster child of how to do Early Access right. Now that it’s out we can see the game in its full glory, but for those that have already played it, not much has changed. I’m not going to be talking much about the base gameplay, as I went into detail about it in the linked spotlight. 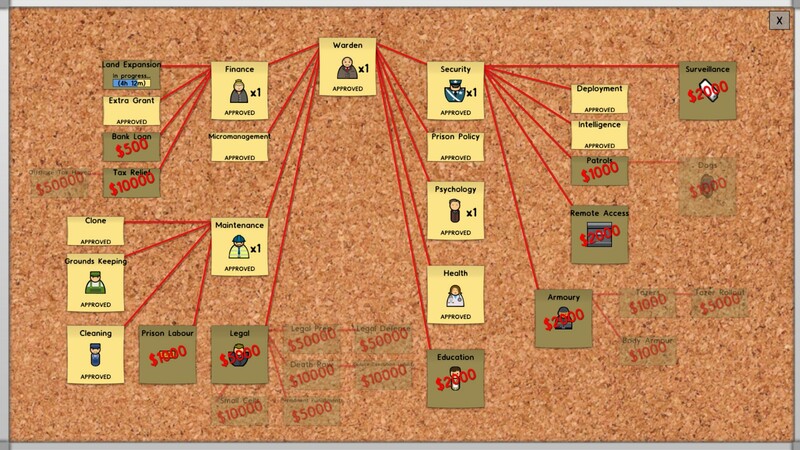 For people coming to this post completely new, Prison Architect is a Bullfrog-style management game from Introversion Software about creating and maintaining a prison. Prison Architect is all about managing an ever escalating set of systems around your prison. Starting out, you can just deal with the basic elements of running a prison: Food, cells, guards. As the game goes on, you can install security cameras, set up education programs and try to rehabilitate as many people as you can…while still making a profit of course. Before we talk about actual new content, I want to go over some of the changes that were added to what was already there. 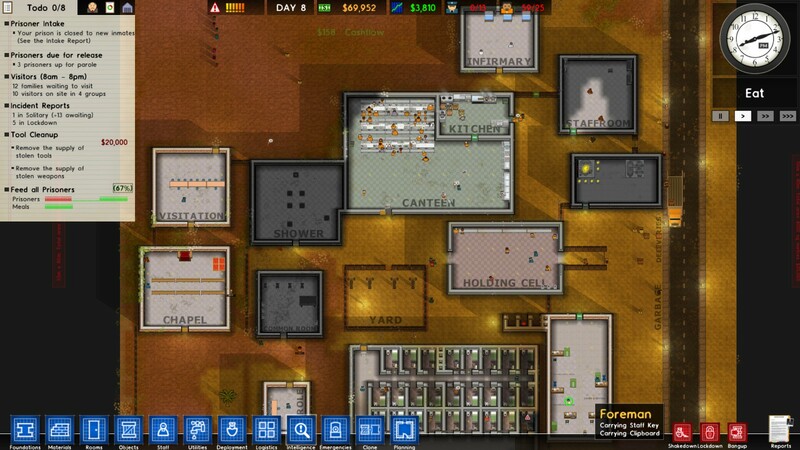 You have far more control over the logistics of your prison now; such as setting up different schedules for different levels of inmates, more control over patrols. While random events and greater prisoner personality will make running your prison a lot more chaotic and helps to shake up the well oiled machine. There are a few new modes in version 1.0 along with little Easter eggs to find. What’s new from the early access versions are two additional ways to play. First is a campaign that follows a set of story lines that also try to teach you the basics of running a prison. These stories also talk about punishment, crime and a lot of other dark topics, but none of that is mentioned in the sandbox game. The second mode is an escape mode, where you’ll play as a prisoner and have to figure a way out of a prison that you created or downloaded from the Steam workshop. Other than a few Easter eggs to find, now much has changed from the last time I played Prison Architect, which is not a good thing. 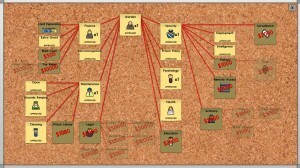 In my previous spotlight of Prison Architect, I commended Introversion for the number of connected systems and their ability to weave all of them into one unique management sim. However, my biggest problem with the game remains and it looks like one that may not have a fix from Introversion: Lack of mechanic growth. When playing management sim or city builder games, one of the biggest challenges is to create an effective early, mid and late game in terms of design. The problem is that the free form nature of the genres makes it hard to change how things grow over time. There are normally two ways to elicit some kind of growth. First, you could set up mechanic unlocks or features that the player can get access to that will change how the game plays; similar to the research options in Big Pharma or having new items and furniture you could unlock in the older Theme games. The second option is to have a grand campaign or mission mode that tasks the player to do specific tasks within the confines of the mechanics; similar to the Impressions city builder games. The campaign option is usually the better fit and when done right can provide two great helpings of your game: The Sandbox mode and the Campaign. The problem with Prison Architect is that the mechanical complexity is all about how they are interconnected, not how the player makes use of them. There is a sense of everything being static in Prison Architect, as once something is placed it requires no further input from you. One of the great things about Big Pharma was the fact that the mechanics offered the player some thought on how to proceed in a game. This was due to how ingredients were randomly generated and how you used your floor space to set up the assembly lines. Even though your input was still less compared to other genres, the player could still inject their personality and strategy into the game. With Prison Architect, due to the flatness of the design, there is just no sense of growth or greater thought process that goes into running the prison. Now of course this also has to do with the theme itself, but there are little things that could have been done beyond the two major examples mentioned. More items would be a biggie, as they would allow someone to customize their prison further and maybe impact the overall running of things. I know of course of the Steam Workshop, but it’s a different story when the developer actually implements it. They sort of had the right idea with different wardens to play as, but their overall impact doesn’t change how the game plays. As it stands, Prison Architect doesn’t go anywhere and runs into the classic problem of city builder games: Once you’ve built one successful prison, there’s just no reason to build another. I would have loved more goals to go after that could unlock new aesthetic items or achievements, anything to give the player some carrot to pursue. I know that I’m coming down really hard on Prison Architect, but as I thought about it more, these problems are all part of one greater issue. 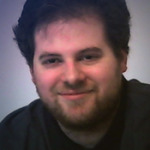 Prison Architect is a wonderful combination of systems and mechanics that are all interconnected between each other, but that interconnection is not shared between the player and how someone would design their prison. One of the joys of management style and city builder games is the ability to use the mechanics to create your own touch, or in other words, your own personal take in the game. In Cities Skylines, the actual city builder aspect of the game is basic: You put buildings down and they do something, but there is the extensive traffic modeling and road system that lets someone go crazy with it. The same with Big Pharma and the assembly line design; while the individual mechanics and uses are kept basic and work the same every time, the player is given a lot of control and can personalize this aspect of the game. Prison Architect doesn’t have that due to the modular design of the rooms and their requirements. A canteen in my prison is going to work exactly the same way as a canteen in 10,000 other prisons and there is no way to leave my personal mark on them through the game systems. The mechanics just don’t offer a way for someone to dig into them and set up their own way of doing things. As I said, the player has extensive control of the logistics of their prison which is great, but none of that translates into how I would be able to build a different prison the next time I load the game up or the next and etc. As a final problem, the game could still do with more in-game explanations of how things work, such as setting up programs, CI’s and other late game systems that the UI doesn’t really touch on. I said this already, but I know that this reads very negatively on Prison Architect and that’s because I was expecting a lot considering the success Introversion had with Early Access. Of course I have to mention that at this time, things are still up in the air as to whether the game is “done” or if they will continue to add content. That means there is a chance that this review will not be accurate about the game, but we can’t talk about a possible future when 1.0 is out right now. 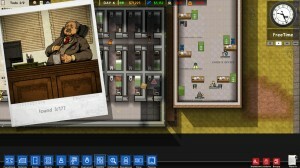 Prison Architect is an impressive management game and getting all the moving parts working is going to be a challenge, but it’s not a challenge that lends itself to multiple plays; just like in real life, most people don’t want to end up in prison again. For more on Prison Architect, you can check out the spotlight video that I did and I might do another one once I have more of my prison up and running.